Explanation: This planet is only 16 light years away -- could it harbor life? Recently discovered exoplanet Gliese 832c has been found in a close orbit around a star that is less bright than our Sun. An interesting coincidence, however, is that Gliese 832c receives just about the same average flux from its parent star as does the Earth. Since the planet was discovered only by a slight wobble in its parent star's motion, the above illustration is just an artistic guess of the planet's appearance -- much remains unknown about Gliese 832c's true mass, size, and atmosphere. 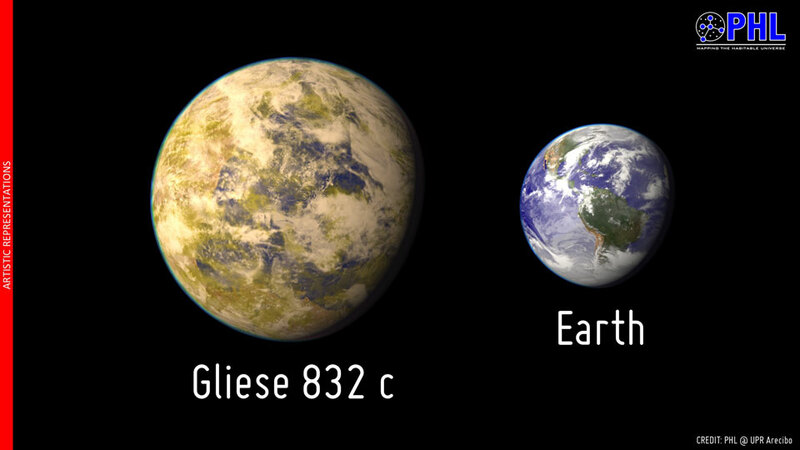 If Gliese 832c has an atmosphere like Earth, it may be a super-Earth undergoing strong seasons but capable of supporting life. Alternatively, if Gliese 832c has a thick atmosphere like Venus, it may be a super-Venus and so unlikely to support life as we know it. The close 16-light year distance makes the Gliese 832 planetary system currently the nearest to Earth that could potentially support life. The proximity of the Gliese 832 system therefore lends itself to more detailed future examination and, in the most spectacularly optimistic scenario, actual communication -- were intelligent life found there.